Here’s one great midrange phone that slipped most tech bloggers’ purview: the LG Q6, the budget version of LG’s first 18:9 display flagship, the G6. 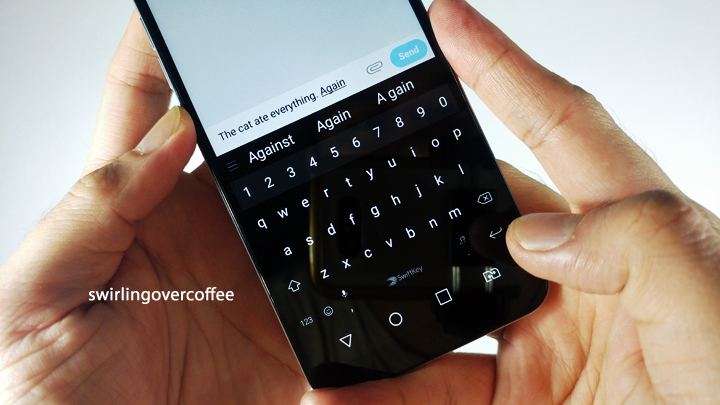 The Q6 won us over with its design, build quality, tactile comfort, and display sharpness (at 442 pixel per inch). 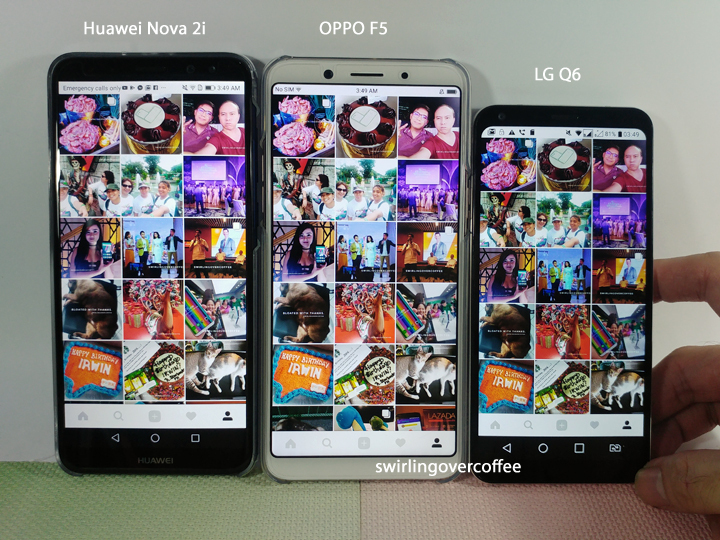 Its single selfie camera, with normal and wide angle field of view (to fit more people in) can compete with other midrange selfie phones (even though LG rarely pitches their midrangers as selfie-focused). The Q6, with its 5.5-inch FHD+ screen, is more compact (narrower screen “waistline”), is slightly thinner, and has a noticeably more premium build (durable aluminum metal frame) than other 18:9 display midrangers, which mostly have 6-inch screens. The glass is silky smooth to swipe on, which only adds to the joy of using such an easy to hold, one-hand-use-friendly P12,990 midranger. But no small-phone-that-can is perfect. Here’s our full review. 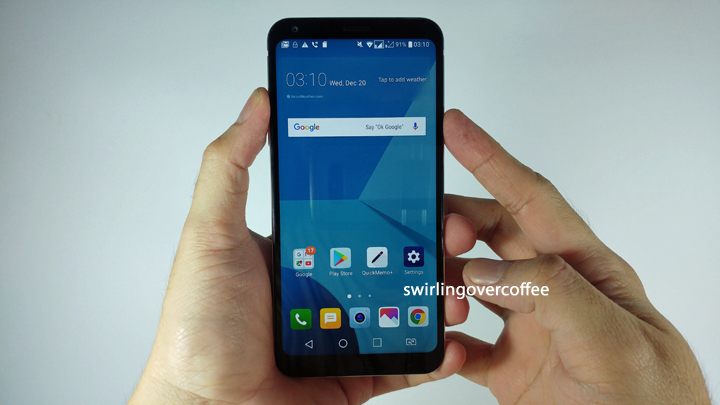 That’s how compact the LG Q6 is. Contents unboxed. No free protective case, but the LG Q6 is a joy to use “bare”. Solid, compact body: it’s like a 5 inch phone with a 5.5-inch display. 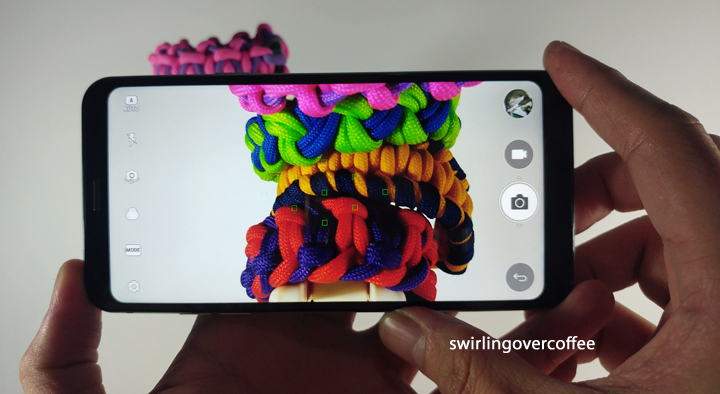 The Q6 fits snugly in your hands, and your thumb can comfortably reach most parts of the display, owing in part to small side bezels and small “waistline”. The tall display makes for a narrow body. Stylish metallic (aluminum) frame – we say “stylish” to mean both “ergonomic” and “no fuss design”. This could have been a chunky phone with pointy corners, but it isn’t. It’s weighs just about right (it won’t fly off your hand like a cheap and light plastic-body phone) but has this “premium” heft: the phone feels “solid” in your hand. Feels durable. Good for one-hand use unlike big, wide phones. 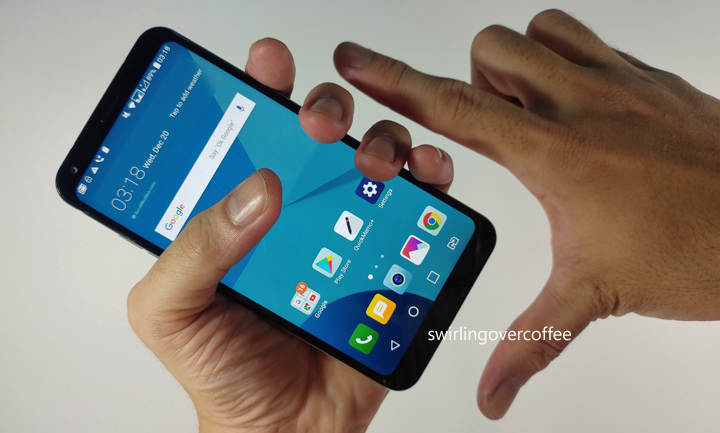 Really comfy in your hand: we keep saying “nice to hold” and “compact” and “comfortable” because the LG Q6 really is the most comfy-compact 18:9 phone right now. The Q6 is probably the first midranger to offer an 18:9 display, and that aspect ratio plus both the slim body and smallish screen make for a really “tiny” phone. We recommend visiting malls and stores where the Q6 is on display and holding the phone to enjoy its premium heft, solid feel, and how it feels nice in your hand. 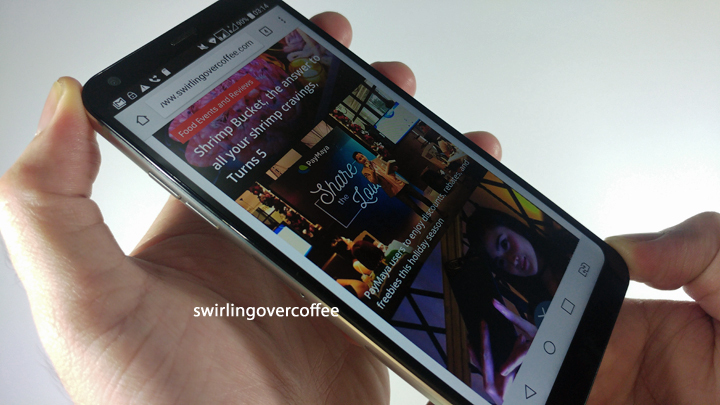 “Smallish” display is as nice to look at as it is pleasing to touch. The 5.5-inch Full HD+ Display is sharp, has natural colors and great viewing angles, and is actually usable outdoors. As with the LG G6, the display offers very good whites (not bluish or dirty white). The Gorilla Glass 3 display is a joy to touch, as your thumb luxuriously and effortlessly glides along the screen, on a glass your finger “knows” is solid and not cheap. The FHD+ resolution on a 5.5-inch display (the “norm” is from 6 inches and up) make for a very sharp display with high pixel per inch, that’s why images are sharp and text are so clear, despite this not being AMOLED. Very loud sound despite rear speaker placement. On max volume, dialogue remains distinctly audible, though bass is a bit weak. Still, you don’t need to cup your hand to direct sound to you. Good enough battery life. As a daily driver with usage consisting of lots of SMS and chat, social media, Uber, a few YouTube videos, and surfing, the stamina is good enough. It will last you throughout your entire shift at work, and depending on the traffic hell on the way home, you won’t need to plug it into your charger until after dinner. But yeah, if you’ll abuse it for videos during the long commute after work, you might need a power bank. Good thing the Q6 is so compact that chances are your power bank will be bigger than the phone itself. 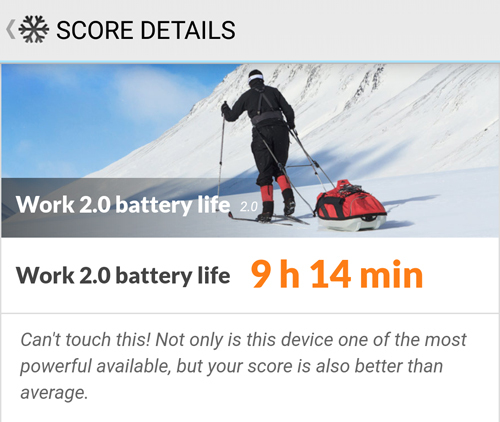 PC Mark Battery Life Score. Fast-enough charging. While the Q6 doesn’t boast of fast charging, it might as well say it does. Charging time, 5% to 100% takes about an hour and 30-40 minutes. An enjoyable video binging device: the combo of great display, good sound, comfy to hold body, and good enough battery life make for a video binging device that will satisfy you. Recommend you use headphones when in public places as ambient noise slightly drowns out dialogue. Also, and again, if you abuse it for video at the end of the day, you may need a power bank. 3GB RAM is enough to keep things fast and fluid. 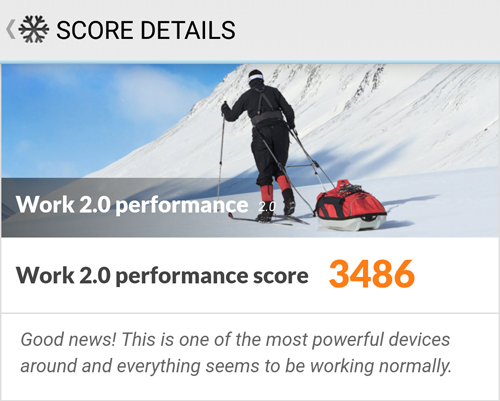 It can handle app launching and app switching fairly well, and we rarely encountered lags or app crashes. Our experience was smooth. Having said that, with more apps open, slowdowns can happen. Just to put this in context: there’s rarely a heavy gaming or super fast phone at the midranger P13k price range with this design. 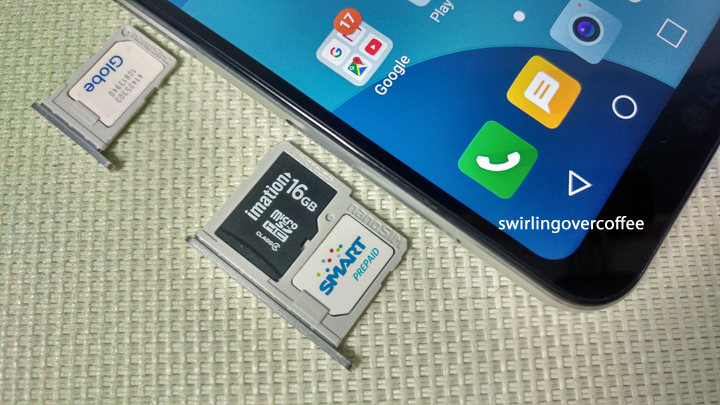 True dual SIM; there’s a dedicated micro SD card slot. None of that annoying hyrbid SIM set up where one slot doubles as the micro SD card slot. Here, you have three dedicated slots. Cameras are spot on for a midranger and offers some useful features. Rear camera output is actually good, despite having no OIS, no dual camera set up, and no manual mode in the default camera app (however you can download camera apps that offer manual mode). Rear camera has food mode, works well in good lighting, slightly struggles in low light (but low light results are still good, impressive for a midranger). See samples shots below. Default camera app offers, for both rear and front cameras, Square Camera mode, which offers four ways to capture image: Snap Shot (take a shot and preview it right way), Grid Shot (take four shots and save it as one grid image), Guide Shot (use one translucent image as guide to take a photo with the same framing), and Match Shot (take two shots saved side by side). The 5MP selfie camera has normal and wide angle field of view (the latter is useful so you can fit more people into the frame). Beauty mode is not abnormally aggressive (you won’t look too Photoshopped). Normal FOV, by the way, is just a cropped out Wide Angle FOV. On screen flash is helpful but only when up close. Rear camera video offers good in-software stabilization and records audio well. LG Q6 Square Camera Mode options walkthrough. 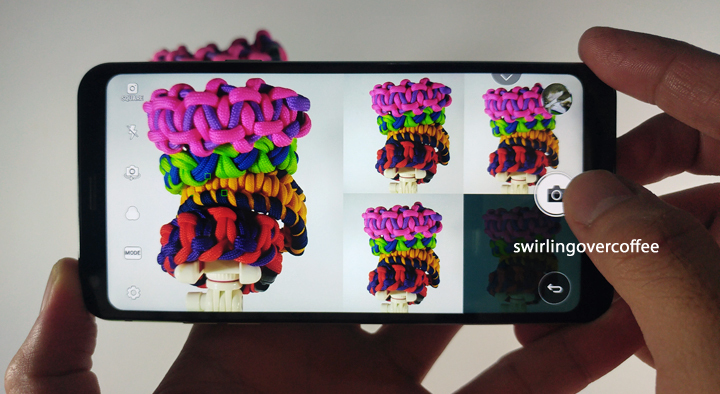 The Square Camera Grid Shot feature in action. How good are the cameras of the LG Q6? See for yourself. The images below were watermarked and resized but otherwise were left as is. No improvements done. No camera bumps on the rear. While a protective case usually covers up this minor annoyance, it’s good to know you can enjoy the Q6 “raw” and place it flat on a table without a camera bump making the phone wobble. Offers app scaling, which is as is expected of an 18:9 phone. But not all apps, right now, are supported. Also, and as expected, videos not in 18:9 are pillar boxed. But more content in 18:9 can change that. Bold Text feature makes text more readable. 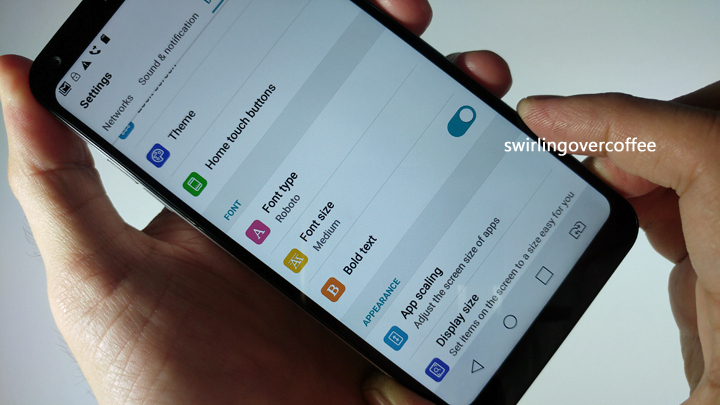 As with other LG phones (like the G6), this feature makes fonts appear in bold, so you can see them better. We love it. Has Face Recognition, which is fast under sufficient lighting. When it doesn’t work, there’s always the PIN or Swipe Pattern to unlock it. 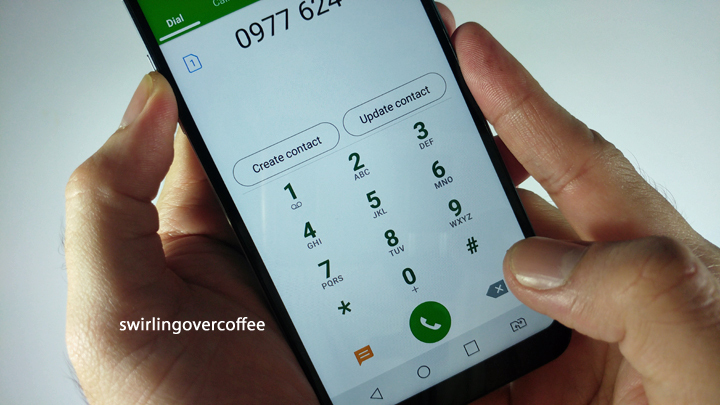 Tandem of Knock On (double tap the display to wake up phone) and face recognition is a winner: it means you can lay the phone flat on the table and unlock it while your fingers are smeared with food and sauce. Just use your knuckles or the “elbow” of your finger to knock on the phone and hover your face above it, to unlock it. Nice. Customization without a separate app. LG Smart World, a pre-installed app, lets you download themes, fonts, and wallpapers. No fingerprint sensor, but has Face Recognition, which is so fast. If the Q6 had a rear fingerprint sensor, it would be a winner. As it is, we ended up relying on old-fashioned PIN and password to unlock the phone. 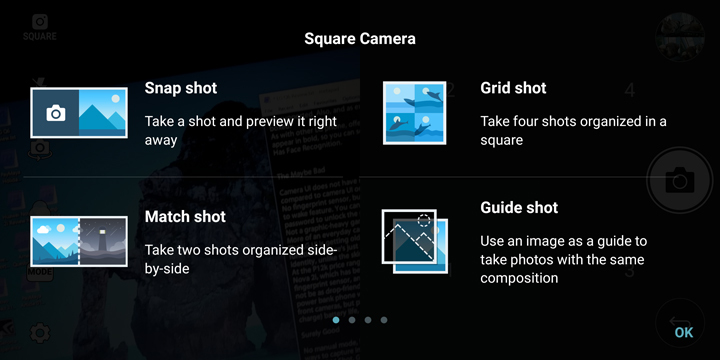 No manual mode on default camera app, but instead offers Square Camera Modes, some of which are helpful. That being said, you can always download camera apps with manual mode. 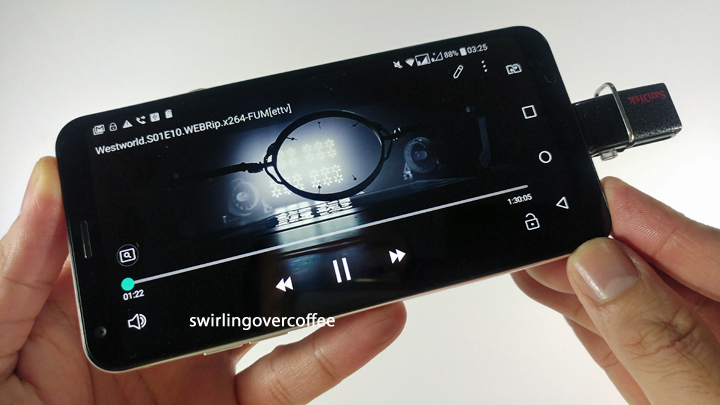 The rear camera UI will be familiar to LG users in its Spartan look and practicality. Not the best midranger in low light scenes. There’s no OIS in the rear camera, which makes it prone to blurs (you need steady hands). Rear camera’s captured sharpness and detail in low light is exceeded by a similarly priced phone, the Huawei GR5 2017 (which has dual rear cameras but doesn’t have a premium build, or a very sharp non-18:9 display). Also, the Q6’s on screen flash for the selfie camera is only useful when up close, doesn’t help much in very low light scenes, and barely helps in groufies. Not a graphic-heavy gaming phone, but light casual games are fine. More of an everyday carry, chat, and social media phone. So, if you don’t need a gaming phone, this is not a deal-breaker. Improved but still bland UI. It does looks more minimalist, this time. 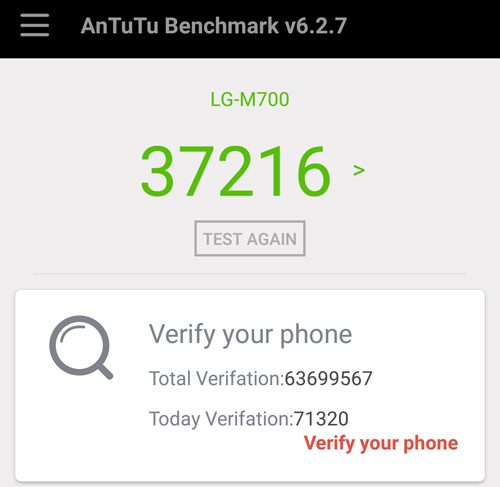 The LG Ui is getting cleaner and is not a pain to look at but remains unexciting. Not to say it’s not functional, it just has no identity, unlike the skins on Huawei, Xiaomi, or Samsung. Face unlock won’t work well in low light. Under bright or medium to low light, it works fine. Not every app is optimized for 18:9 display. But the ones that are are listed. We think this is a work-in-progress for app developers who want their apps scaled properly to the new 18:9 display trend, and it’s not LG’s fault. Plastic rear is prone to scratches. While we love to use the LG Q6 “raw”, we also don’t want it scratched. You’d better get a case for it. There’s no free protective case in the box, something that’s almost standard these days. In your hand, the LG Q6 feels like a 5-inch phone, not a 5.5-inch one. Dimensions, build quality, proportions, curved-corners look, tactile handling, and physical-comfort-over-time are spot-on. Display is sharp and colors punchy. The rear-facing speaker provide audio that is loud enough without feeling too strained at max volume (but not enough base). 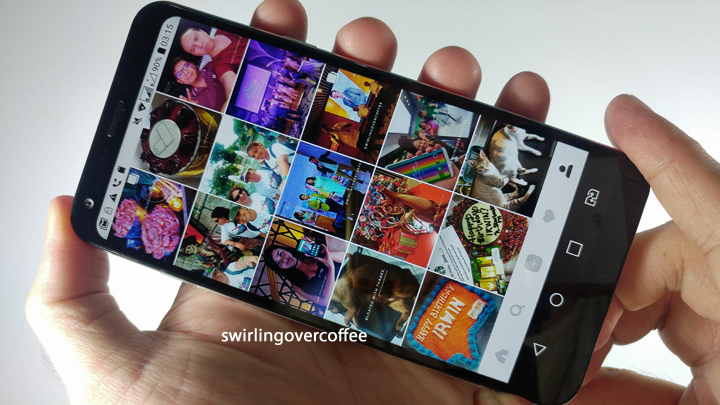 Unlike other midrange 18:9 phones, the Q6 has both a (1) metal frame with solid non-creaking non-plastic-feeling body, and (2) glass that feels luxurious to touch (neither of which are present in the OPPO F5 and Huwaei Nova 2i). That slight metallic heft is nice, and the rear plastic part is not as slippery as we first thought (however, it’s prone to scratches, so recommend you find a case). It’s not a graphics-heavy gaming phone though, and we don’t mind that it’s not (at this price point). Not everyone one needs a gaming or super selfie phone. But some of us want something we can depend on and enjoy using. The sheer ease and joy of use (comfy in your hand, sturdy metal frame and compact body, the reassuring but slight heft) can almost make up for the Q6’s lack of fingerprint sensor (whose inclusion would have made the phone perfect for its price point). Without it (even P7k budget phones have one), the Q6 feels overpriced. If you can live without a fingerprint sensor, and you’re okay with good-enough cameras and acceptable battery life, you’ll like the LG Q6. It fits your hand, (maybe) your budget, your daily driver use, casual photography itch, and social media needs. The sheer ease and joy of use (comfy in your hand, sturdy metal frame and compact body, the reassuring but slight heft) can almost make up for the Q6's lack of fingerprint sensor (whose inclusion would have made the phone perfect for its price point). Without it (even P7k budget phones have one), the Q6 feels overpriced. If you can live without a fingerprint sensor, and you're ok with good enough cameras and acceptable battery life, you'll like the LG Q6. It fits your hand, (maybe) your budget, your daily driver use, casual photography itch, and social media needs.